Uber drones are bullying people who don't carpool. In an effort that’s equal parts creative advertising and environmental awareness, drones are being utlized by ride-sharing company Uber, in Mexico City. 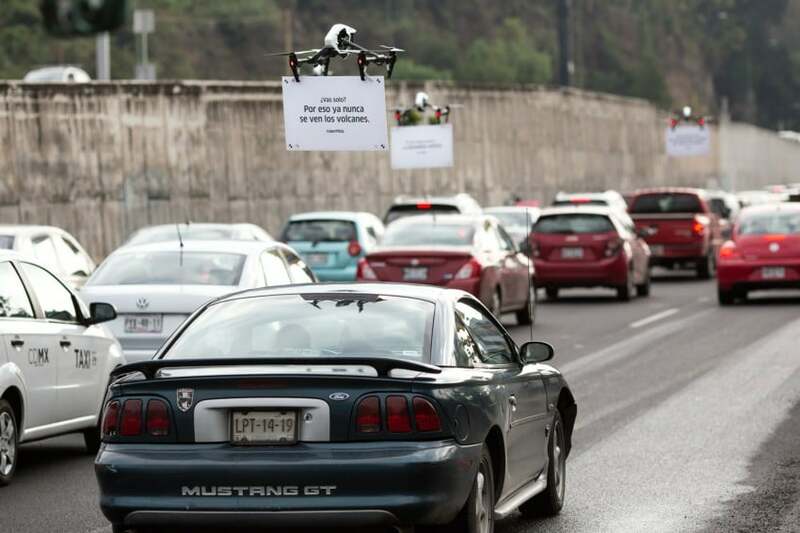 The fleet of drones held up signs that seemed to heckle drivers stuck in traffic with questions such as “driving by yourself?” and statements like “this is why you can never see the volcanoes.” The latter is a reference to the vehicular smog that conceals the nearby landscape. While Uber’s intent is to highlight and promote their UberPOOL service, it’s also notable that availing of this service could lower the volume of vehicles on the road, thus minimizing carbon emissions and preventing road congestion. Uber’s effort brings to light a new age in transportation, where the focus isn’t simply on how we drive, but the overall and long-term impact our transportation decisions have on the environment.